BC High senior Carl Pierre (left) and Needham junior Thomas Shaughnessy are both poised for big seasons. They'll face each other Tuesday night in one of the MIAA's best early season matchups. In last year’s south sectional quarterfinals, Needham’s then-sophomore standout Thomas Shaughnessy had himself an evening to remember against Catholic Conference power BC High. The left-handed shooting guard poured in 20 points including four three pointers all in the first half to help boost the Rockets to a 53-50 advantage with a little over a minute to go. On the other side, the Eagles had a junior star who was having his own coming out party. Carl Pierre, a Randolph native stationed at shooting guard as well, showcased an ability to knock down three pointers from the corner and wing while driving to the basket with his opposite hand. On that Friday night, however, it was Pierre’s free throw shooting that would prove to be most impactful. With the score tied at 53 and only four seconds to go, Pierre knocked down consecutive free throws to give the Eagles a 55-53 lead. Down at the other end, Shaughnessy missed a potential game-winning step back three pointer as the clock expired to give BC High a spot in the sectional semifinals. The loss for the Rockets was nothing short of painful. Needham had the ball up three with just under 90 seconds left and simply could not put BC High away. Then, with the game tied and under a minute to play, a mid-range jumper from Shaughnessy hit the back rim, giving Pierre and the Eagles a shot for a last second win. Now, a little more than nine months later, Shaughnessy will get his chance at retribution when the two square off in Tuesday night’s opener at Needham High School. Shaughnessy said the loss is firmly ingrained in his memory. The Eagles and Rockets have developed a bit of a non-conference rivalry over the last couple of years, and most of that has to do with each of their respective stars. 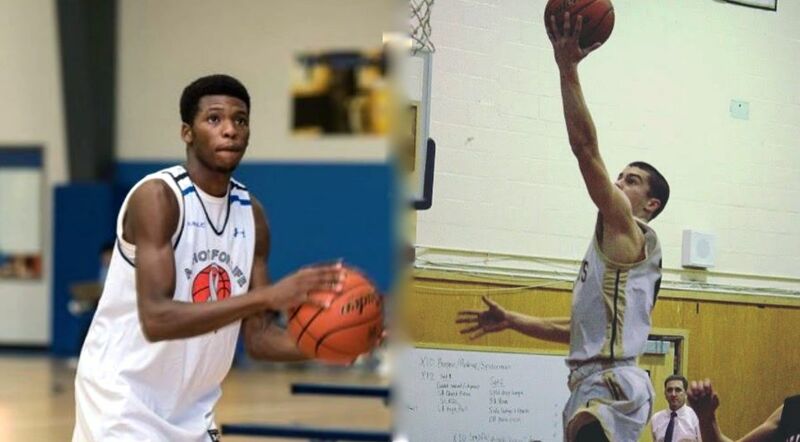 Shaughnessy and Pierre do not just battle against each other whenever their respective teams meet in season, but they face off against one another over the summer while playing AAU. Unlike last year, however, the two will no longer be able to hide behind their team’s senior captains to try and stay under the radar. The loss of Jack Loughnane to graduation immediately makes Pierre the focus of the Eagles and the subject of undoubtedly the opposing teams best defender. Needham, for its part, was able to receive significant offensive production from Henderson Parker last season, causing the Eagles' attention to deviate from Shaughnessy for portions of the state tournament game. Shaughnessy says he knows he will receive heavy attention from opposing defenses this season. The Needham native has a habit of breaking opponents' ankles, using his superb ball handling with his left hand to get the defender on his heels. Once he gets some space, Shaughnessy pulls up in the defender's face for a mid-range jumper. Shaughnessy is equally lethal from beyond the arc, showing the ability to catch and shoot, or pull up from anywhere behind the three point line. Shaughnessy does not only represent a potential Division I prospect, but is also a symbol of a Rockets program that is ready to lift off. Over the last three seasons, Needham has made the south sectional quarterfinals, culminating in last year, which saw the Rockets go 18-4. This upcoming winter though, coach Paul Liner hopes to take the next step in asserting the Rockets as one of the premier teams in Division 1. Pierre, meanwhile, will be in the BC High starting lineup on Tuesday evening for the third consecutive season. After mostly learning from upperclassmen like Isaiah Bowman and Loughnane in his first year in the Eagles' varsity rotation, Pierre took a more prominent role last year. He began developing a smooth shot early in his junior year that is highlighted by a quick release, making it nearly impossible for a defender to close out in time. During the 2015-2016 season, the now-Eagle captain scored 18.1 PPG on 49 percent shooting. Piere’s ability to shoot from beyond the arc, coupled with his 6’ 3” length and immense wingspan make him a matchup nightmare. He is not only the Eagles’ leading scorer, but also one of their top rebounders, allowing coach Bill Loughnane to play his notorious “11” zone. Perhaps the most impressive aspect of Pierre’s game though is his ability to play just about any position on the floor. When point guard Travis Evee takes a breather, Pierre appears more than capable of sliding over and becoming the floor general. If Lougnane chooses to go small and put Myles Owens in the game at two-guard, Pierre can move to the power forward position, where his athleticism can make him unstoppable against most opposing big men. For Shaughnessy, the most impressive aspect of Pierre’s game is his ability to create his own shot. The Eagles, despite knocking off Needham in last year’s south sectional quarterfinals, still failed to reach their first sectional final since 2009. Pierre knows that if BC High is return to their late 2000s dominance, a win on Tuesday night is vital. Based on the way last season ended, Shaughnessy is more than prepared to make sure the message sent on Tuesday is one that the Rockets have finally arrived. Regardless of which one of these stars comes out on top Tuesday night, there is almost no question that if these two teams hope to accomplish their ultimate goal, they will likely meet once again in March.